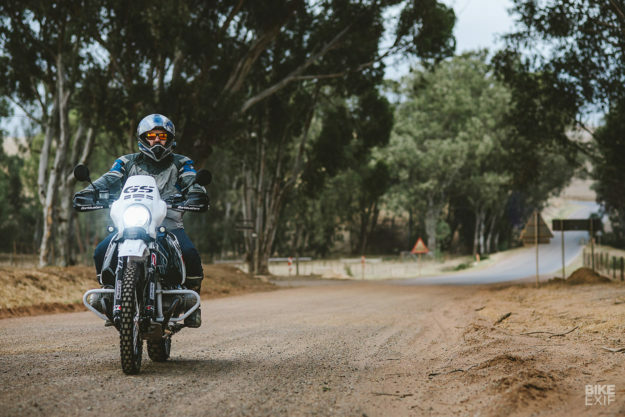 On Saturday, the Dakar Rally kicks off in Lima, Peru. It’s the 40th edition of the notorious race, and a lot has changed since 1978, when intrepid racers lined in up Paris. 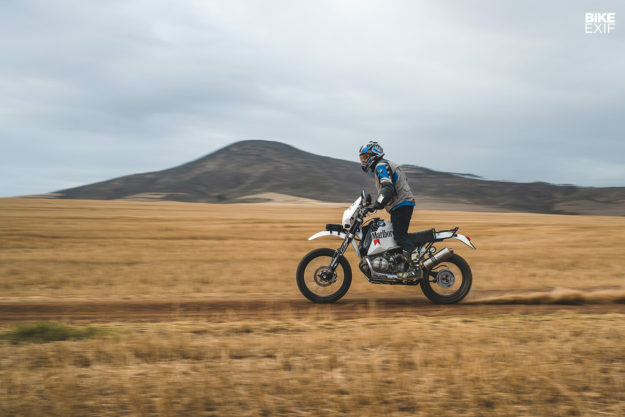 Modern Dakar bikes are lightweight, sophisticated off-roaders, with a maximum capacity of 450cc. 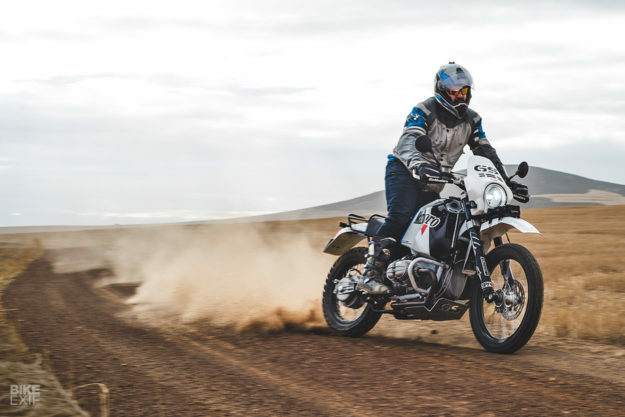 But the early days of the rally were dominated by mammoth desert racers—like the mighty BMW R80G/S, which racked up four wins in the 80s. 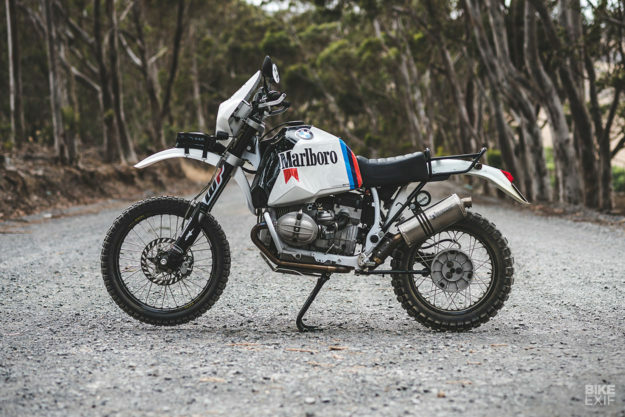 This immaculate 1982 model is a restomod owned by Mark Johnston, and it’s a spectacular homage to the Dakar-winning days of the Gelände/Straße. 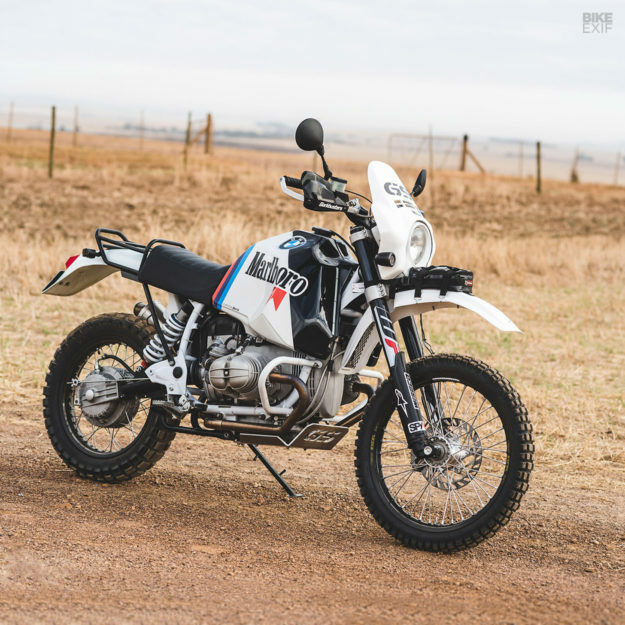 Remarkably, it’s only Mark’s second build: we featured his first last year, and when we teased a shot of this R80G/S alongside, readers insisted on seeing more. Mark lives in the northern suburbs of Cape Town, South Africa, but bought the bike blind from a guy upcountry in Pretoria. ‘OK’ didn’t stop Mark from ripping out the G/S’s motor and shipping it to Volker Schroer in Port Elizabeth. Volker rebuilt it from the ground up, bumping the capacity to 1,000 cc with a big bore kit from Siebenrock. The work included gas flowing the heads, and installing valves suitable for unleaded petrol. The exhaust silencer is from Akrapovič, but the header is custom, courtesy of Scorch Design. Back home, Mark began transforming the classic Beemer’s chassis. He started with a set of 48mm upside-down WP Suspension forks up front, liberated from a KTM 525 EXC. The forks were also fully rebuilt, with new stanchions and stiffer springs. They’re hooked up to the bike via a set of custom triples, made by Mark’s go-to guy for machining: Ian Ketterer at BlackSilver Customs. 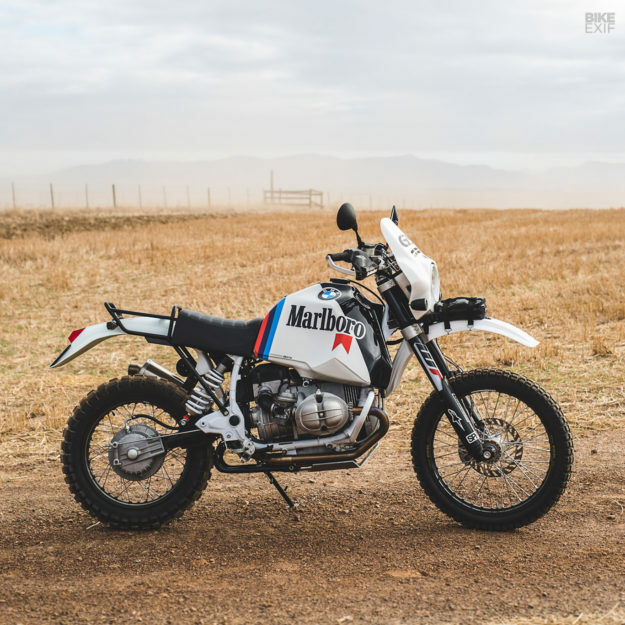 The front wheel is an all-new custom setup, and the front brake caliper was rebuilt and connected to a new master cylinder. Out back, the swingarm was lengthened by almost two inches, and an offset added so that a 140-section tire could be squeezed in. The rear shock’s a one-off too, built by local suspension guru Martin Paetzold at MP Custom Valve. The subframe’s another custom piece, built for one and with a non-removable luggage rack. Look further down, and you’ll notice that the subframe support struts also include tiny hooks for securing luggage straps. For the seat, Mark used the original two-up pan, but cut it shorter and reshaped the back with fiberglass to accommodate the rear fender. He then re-shaped the foam, added a gel pad and sent the seat to Alfin Upholsterers for a fresh cover. Just in front of it is an HPN rally tank, imported from Germany and painted in a variant of the original Paris Dakar race livery. The headlight mask is an OEM BMW item (from the original ‘Paris Dakar’ edition of the R80G/S), but revised to work with quick-release straps. Off-road style fenders conclude the bodywork at each end. Most of those changes are glaringly obvious, but there’s an endless list of subtle mods too. Mark built a new side stand (and side stand mount), relocating it to further back. 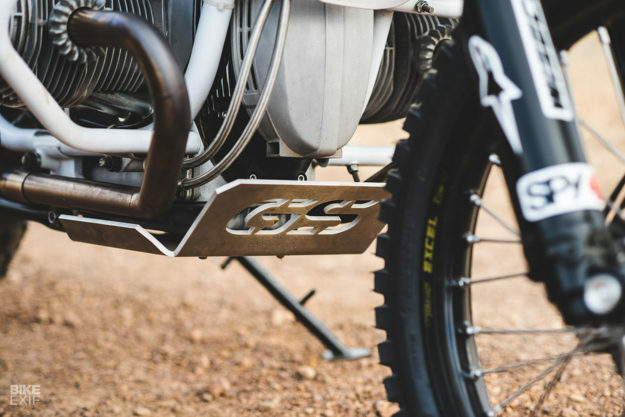 The foot pegs have been swapped for burly off-road items, mounted on lowering spacers. And the rear brake lever setup has been modded to keep it safe from rocks. 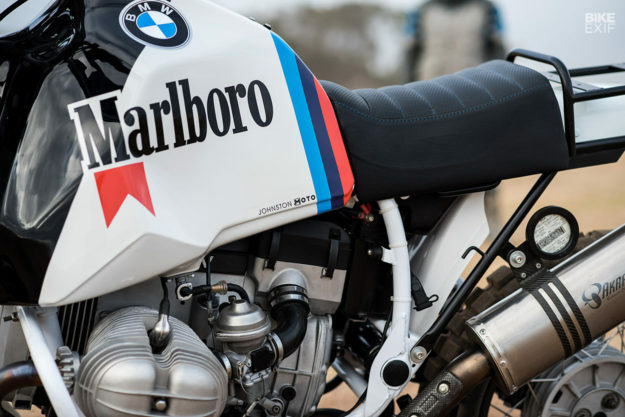 There’s no choke lever up top though—Mark ditched it in favor of small choke pulls on the carbs. He also built custom breathers for the diff and gearbox. The cockpit’s a combination of original switchgear, a simple Acewell speedo and ProTaper Evo handlebars, attached to custom risers. Also present are foldaway mirrors and a set of Barkbuster hand guards. And both the headlight and spots are LED-equipped. We can also spot crash bars, a sump guard, and support strut for the front fender. 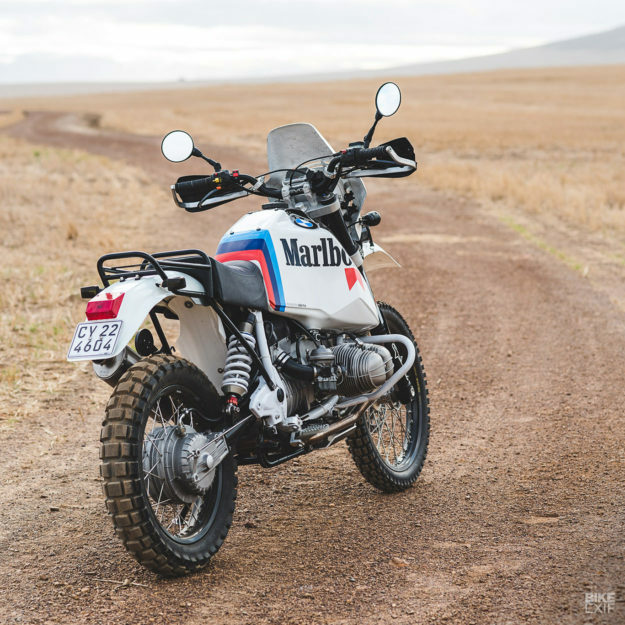 It’s clear that Mark designed this R80G/S to go off-piste, which it already has. 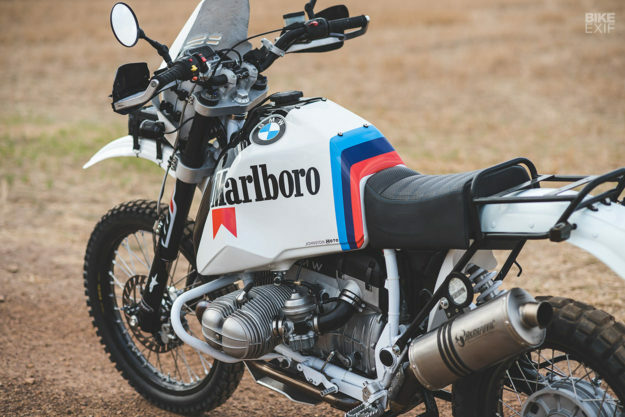 Though it wasn’t Mark’s plan originally, the R80G/S is already sold. 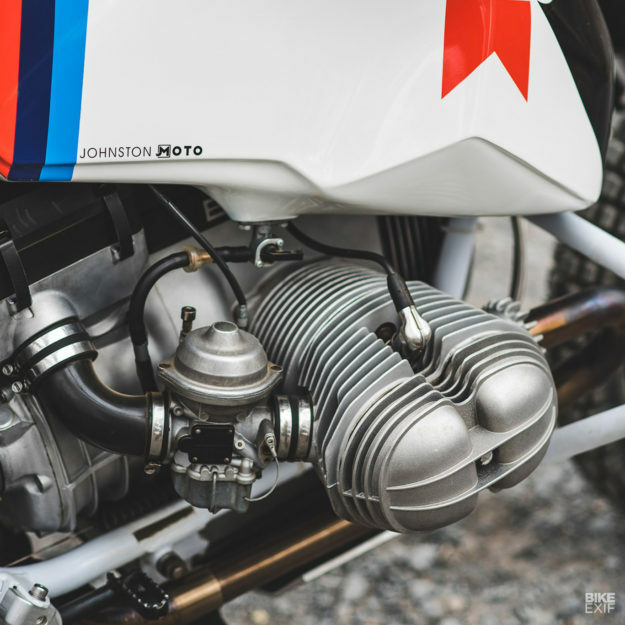 And we’re not surprised—even though building bikes is an after-hours endeavor for Mr Johnston, he certainly has the eye, talent and determination to make it work. The sale also spurred him on to tackle more projects. 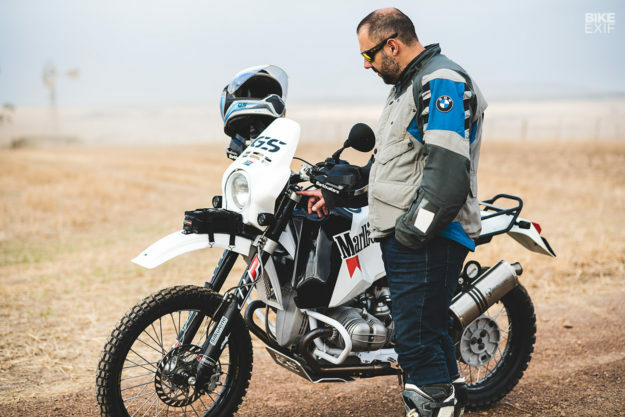 So he’s officially launched Johnston Moto, with a view to cranking out a couple of builds a year. Who else is looking forward to seeing what he comes up with next? In addition to the mentioned suppliers, Mark would also like to thank Willie De Kock and Ian Blomeyer for their support.